Oh, so good. Man, Russia was intense and Lark’s back story was so well developed. So much drama. So much depth. So much action. Loved. Every. Second. Of. It. Lark and Charlie have been around since book one in the original London Steampunk series. Charlie is Honoria’s brother who Blade helps deal with the craving virus. Lark showed up with Tin Man very early on and Charlie and Lark have been inseparable ever since. They grew up together and when Tim Man is killed Charlie leaves Lark behind and she hasn’t forgiven him in the years since the revolution. 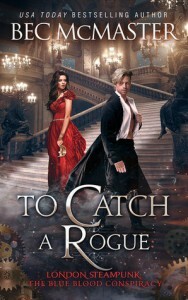 But they are brought back together finally because Charlie is part of the Company of Rogues and he needs Lark’s expertise to rescue Malloryn from the enemy’s hands. What he doesn’t understand is that by asking her to go to Russia literally puts her life in danger and brings to light all of the secrets she has been hiding her whole life. I loved their story. I loved Lark’s background story and how it connects to Obsidian. So good. I want her brother Nicholi to have his own story and I am SO ready for Malloryn’s story too. I read the teaser at the end of this story and his story is next. YAY. So good. So intense. So awesome.